Notice: please buy it from Mon Art!! As a professional artwork manufacturers.We stand by our top quality and strive to make your favorite paintings as accurately as possible.We feature a paintings gallery with thousands of decorative oil paintings for sale and beautiful canvas prints from a multitude of periods and styles including modern art, contemporary art, abstract art, famous art, pop art and much more, to satisfy all of your fine art needs. 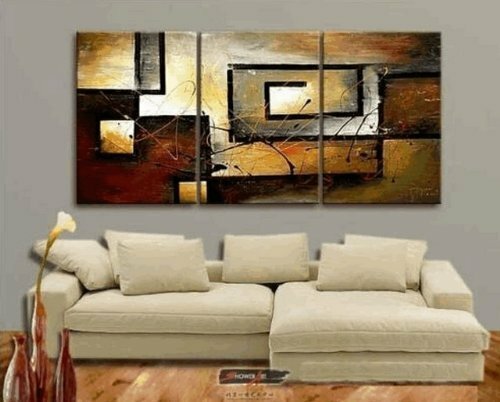 Every wall art use only the museum quality oil paints and canvas. 16X24X3pics, (Inch) total 3pieces. Oil Painting on Canvas, 100% Hand Painted by Professional Artist (*Not a print, not a poster, not a transfer of Canvas). Condition: Brand New, High Quality, Framed/Stretched. Shipped in a box. In Stock, handling time 2 businessdays plus about 10-15 days EMS (Express Mail Service) delivery, so the package usually arrives to your door in about 12-17 days after we receive your payment.